Happily Ever After!! : Sickness Plagues the Maroney Clan!! Sickness Plagues the Maroney Clan!! My little man is a HUGE trooper!! 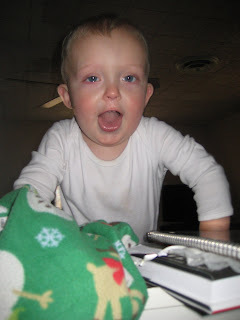 Last Monday when I picked Grant up from Grandma Maroney’s, he had a really bad runny nose. By the time we got home, feed and ready for bed, he was running a temperature over 100. It is extremely important to me that my family comes first, so when Grant woke up on Tuesday morning sicker than sick, I was eager to aide him back to health. Grant continued to be sick for all of Tuesday, so it was no surprise when I woke up with a blistering headache Wednesday morning. Mark’s mom took Grant for a few hours so that I could get caught up on rest. But Grant was still very sick himself. 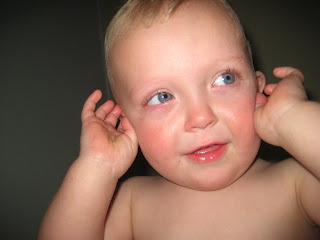 That night, Mark and I took him to urgent care where we learned he had an ear infection. My little trooper!! He never pulled at his ear or anything. 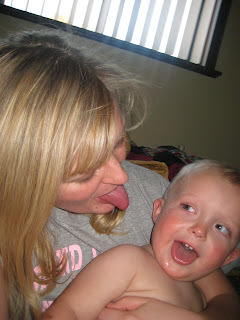 He was cuddley and running a high fever, but he was never too much to handle, he toughed it out!! The next morning, I knew I had to go back to work. I work for a hospital, and I felt like grade-A crap! So I called and made an appointment for myself in one of our clinics. There I was told to go home, that I had an upper respiratory infection!! Oh, and an ear infection myself!! I wanted to cry, because I was in a lot of pain. I am blessed that Mark is there for me. He helps support me mentally and emotionally. He did everything he could to take care of me. I love him so much!! In case you are wondering how to keep an ill child happy, pull out a camera and start taking pictures!! He loved having the camera around :) I love my little man!!! He makes me happy, even when he is sick. Wow, our families are so alike! Mason is just getting over a double ear infection. They are so not fun. You sound so happy and it makes me soo happy for you! You have such a precious family and I am sure you are enjoying every minute of it!! The Garden of Eden, hee hee. Life just started moving a little faster! !